JeremyREteacher | Teacher in NZ who is learning everyday. Teacher in NZ who is learning everyday. We live in a rapidly changing context in education that is becoming increasingly complex. To meet these challenges policy has focused on the ability of institutions to work together for the benefits of their clients. In this essay, I will review the Communities of Learning in Aotearoa policy for improvement in education at the local level through the four lenses of policy, social capital, learning and leadership. The Communities of Learning policy in Aotearoa, was announced in December, 2014. My interest in this policy is for Catholic Schools to work in partnership to address educational challenges to student learning, better than by working in isolation. I am the Education Adviser for the Christchurch Diocese. My role is to support Catholic Primary and Secondary schools in their delivery of the mandated Religious Education programme and to support their Catholic Special Character development. Our Catholic school community is 35 Primary and Secondary schools, totaling 8,000 students. Strong social ties are present through our Catholic faith and we focus on developing children in the way of Christ. The Community of Learning policy is an opportunity for schools to work together in partnership to achieve better educational outcomes to the challenges that currently face our communities. This essay will discuss collaboration as a policy agenda, analysing why we need to collaborate and who is driving this within Aotearoa. Secondly I will explore the concept of social capital and how this is developed, then investigate the capacity for learning and innovation and close with how we will lead and from where for a Community of Learning to be effective. Throughout this analysis, I will reflect on the strengths and weaknesses of this policy and where I sit and what changes I need to make in my practice based on the literature. The education system of Aotearoa is in a climate of change where we must shift from a 20th century model to meet the needs of our 21st century learners. Communities of Learning could be the shift in practice that we need in order to deliver this. Collaboration as a policy agenda has become increasingly prominent in global policy narratives due to globalisation, which has fragmented the tidy lines of national identities. Globalisation is a seismic shift in our society. Economically, it has increased stateless trade, politically reduced sovereignty in economic and social conditions (Linder, 2011) and brought great benefits and challenges. The focus is now on collaboration as being a vehicle for operating in “multi-organisational arrangements to solve problems that cannot be solved by single organisations” (O’Reilly & Reed, 2011, p. 1095). Collaboration in this sense is dynamic and emergent, rather than a static process (Jansen, Cammock & Conner, 2011) and can lead to greater innovation with partnerships of public, private and voluntary agencies better equipped to address issues (Glatter, 2003, p.43). Collaboration as a policy agenda in Aotearoa draws its genesis from its OECD partners, the United Kingdom, United States of America and Australia. Importance is placed on the clientele of the policy as well as how their future population will compete for work opportunities. In the United Kingdom the collaborative policy approach was adopted in the 1980’s and 1990’s, with collaborative discourse in social policy, particularly in education increasing in recent years with a strategic approach to sharing improved educational outcomes and responsibility with schools clustered together, rather than operating independently (Glatter, 2003). Within the United Kingdom, the “Government has focused on a personalised education for every child so that their needs can be properly met” (Tomlinson, 2003, as cited in Glatter, 2003). Our trans-Tasman neighbor, Australia has focused on multi agency partnerships promoted by “policy agencies and governments since the 1980’s” (Seddon & Ferguson, 2009 p, 92 as cited in Hayes, 2011). Partnerships through collaboration have become an increasingly common means by which complex problems requiring a coordinated response. We see this at a local level where “rather than things being done to people in a community” (Smyth, 2008 as cited in Hayes, 2011), policy is focused on empowering local people through partnerships and communication. The challenges around collaboration as a policy agenda are that the policy does not always identify the “issues with successful collaboration and overestimates the future and practical outcomes that it will produce” (Hudson, 1999 as cited in Higham & Yeomans, 2010). For example, those institutions already operating successfully work with those who will have no direct benefit to them or their outcomes. Relationships such as this cannot be “forced to work and will do so when there is a collective will amongst the participants” (Lowndes & Skelcher, 1998 as cited in Glatter, 2003), to move away from a model of market competition. This sees the emergence in our globalised society, of the importance of social capital in our policies. Hargreaves (2003) notes social capital is the investment in social relations with expected returns. As a result, the information between individuals and groups increases, as those in strategic positions will provide the collective group with useful information (McCormick, Fox, Carmichael & Proctor, 2011). We are encouraged to collaborate in education, due to the benefits seen in the United Kingdom and Australia. Schools made “more than expected or expected progress and in collaboration with a partnership with multiple institutions involved” (Higham & Yeomans, 2010, p.385). This has seen the creation of Communities of Learning policy from the Ministry of Education. Early childhood centres, primary and secondary schools form a Community of learning and develop shared achievement challenges around specific curriculum areas to increase and enhance student achievement. The policy is a significant shift away from the competitive Tomorrow Schools model of the late 1980’s to a model where schools share effective leaders, teachers and pedagogy. Locally in Christchurch, 132 educational institutions are in Communities of Learning (Ministry of Education, personal communication, September 6, 2017). Early signs in my local Community of Learning are positive with growing levels of trust, accountability and sharing of expertise (A. T. Shaw, personal communication, September 20, 2017). Collaboration as a policy agenda is within the discourse of social policy due to globalisation, the growing complexity of our society and the positive impact that organisations working together can achieve. This lens of collaboration is analysed with the recent Communities of Learning policy released by the Ministry of Education to address the equity of education in Aotearoa. The Community of Learning policy genesis comes from a focus on improving outcomes for all students measured through the New Zealand Curriculum and student achievement (Ministry of Education, 2014). The Ministry of Education reviewed evidence of what makes the biggest difference to student achievement, current strengths and weaknesses and what other nations were doing to address achievement challenges (Parata, 2014). Investing in education through targeted funding and teaching and leadership opportunities to share good practice across educational institutions were identified as features for raising educational achievement. It is an example of “joined up thinking, by placing clients at the centre of social provision” (Higham & Yeomans, 2010, p.389), in order for schools and services to meet the needs of students through this type of thinking schools will engage in collaboration for the benefits it creates for students and teachers (Higham & Yeomans, 2010). Here a strategic approach is taken to sharing responsibility for raising achievement across schools who work together in partnership. Although this is not explicit, the policy is drawn from educational policy changes in the United Kingdom. In 2003, David Miliband, the Minister of School Standards stated the Government was aiming for a, “genuinely personalised education for every child so that needs are properly met” (Glatter, 2003, p.16). The student will be at the centre – the tensions “between individual institutions have got to be faced and resolved” (Tomlinson, 2003 as cited in Glatter, 2003). For partnership to be successful there must committed intent by CoL members to set clear aims, values and surrender some institutional authority; rather than merely focusing on taking advantage of additional funding streams. Through collaboration, virtually “all schools reported that they had made more than expected or expected progress” (Higham & Yeomans, 2010, p.387). The Community of Learning policy does not present what types of connections are going to support collaboration in keeping what is working and what areas to development through collaborative practice. Accountability for Cross School and Lead Principal positions is based on increases in achievement data (Parata, 2014). There is no mention of what year levels are important for achievement challenges and how to create these for those who have schools from different socioeconomic backgrounds, if not in a geographical Community of Learning. Actor network theory could provide an understanding as to how organisations operate in collaboration. Actor network theory is used to question, “the organisational means that allows these formations to function in this way” (Hayes, 2011, p.249). This theory asks why collaboration and effective partnerships are necessary and how the materials we have available are ordered and organised to benefit the people living in our communities (McCormick, Fox, Carmichael & Proctor, 2011). Importance is placed on “relationships and associations on dynamic patterns of action and coordination, rather than on structures and institutions” (Latour, 2005 as cited in Hayes, 2011). Through the application of this theory, policy is able to investigate how our current education sector can be reformed to address the needs of New Zealand society today. Social capital cannot be limited to one single theory or description. It is a theory of how an individual or group accesses resources embedded in a network and how they mobilise this for action (Field, 2009, Bourdieu, 1986, Coleman, 1998). It functions by working within social structures to promote actions that are “productive making possible achievement that would not be possible without its functioning” (Coleman, 1988, p.98) and is based on the size of their network of strong and weak ties (Bourdieu, 1986). Network models have strong ties, where actors are tightly bonded to one another communicating regularly and knowing similar information (Granovetter, 1973, Granovetter, 1983, Dhillon, 2009, Lawrence, 2007). Weak ties in a network operate when an actor is a member of many networks, connecting and linking strong tie networks together (Granovetter, 1973, Granovetter, 1983, Lawrence, 2007, Coleman, 1988) and can often be called a ‘bridge’ within a network. Partnerships are framed as allowing individuals and organisations to achieve more than if they remain in isolated silos, through shared learning and knowledge creation. The strength of ties amongst “key individuals are important in the early development of partnerships” (Dhillon, 2009, p.697), in the networking stage where trust is fundamental for effective partnership to work (Granovetter, 1973). An example of this is in the research of Dhillon (2009), and the Midlands Urban Partnership. In interviews “70% of members affirmed trust as being fundamental to success” (Dhillon, 2009, p.699). The trust, norms and values within this partnership develop social capital and sustain a successful partnership. Drivers for partnership in Community of Learning policy are, shared interests around learners and needs that can be addressed by working together for mutual benefit. Aspects of social capital that can support partnership are through, “networks, high levels of trust and shared norms amongst key participants” (Dhillon, 2009, p. 687). This is important for Communities of Learning and how they can work together to pool their resources together for good practice in order to raise student achievement across their community. Schools play an important role in the development of social capital in a network, when forming connections beyond their immediate school for students and teachers. A challenge to this are the, “powerful hierarchies who tend to hide the network assets” (Field, 2009, p.28), and is a shift required for schools entering into a Community of Learning. The policy will also develop the ability of schools with limited weak ties who currently do not have access to information from their wider social learning system (Granovetter, 1983). Currently, schools have strong stores of social capital through strong ties. This is present in professional learning groups where teachers are learning from one another through a system of reciprocity and sharing of practice. However, within this strong tie community “everyone roughly knows the same things, compared to the potential of weak ties” (Lawrence, 2007, p.13), which could offer more teaching practice development. Weak ties through Cross School Leaders become important in Communities of Learning through the adoption of innovative practice to raise achievement where Cross School Leaders move in circles that have different information from a strong tie network (Granovetter, 1983). The development of weak tie relationships could lead to more sharing of classroom practice and the transfer of effective practice across the Community of Schools when, “substantially modified before it can have relevance in the new context” (Lawrence, 2007, p.18). Community of Learning policy has the potential to develop social capital although; it is not clear because of the complex system Communities of Learning will take. What is important is forming strong relationships around common goals in a network of strong and weak ties. Social learning systems are characterised by, “structure, complex relationships, self organisation, dynamic boundaries and ongoing negotiation of identity”. (Wenger, 2010, p.179). Learning within the social learning system is different to professional development, where it is “more than gaining skills and knowledge but becoming a certain person” (Wenger, 2010, p.181) within the structures of the community that members agree to. Social learning can occur in a range of manners, which has seen the development of new ‘hybrid’ learning spaces (Solomon, Boud & Rooney, 2006), where an “individual is working and socialising” (Solomon, Boud & Rooney, 2006, p.5). This form of learning enhances our professional capital, allowing teachers to work effectively together to bring about effective change in school improvement (Rincón-Gallardo & Fullan, 2016). This is evident in the research by Chapman & Mujis (2014), where federated schools in partnership were compared to non-federated schools of similar performance. Two years after joining the federation, schools involved in a federation were performing better than their non-federated institutions. Reasons for this improvement could be the role of teachers being change agents in practice through opportunities to teach each other best practice; share their learning and engage in research and critique (Lieberman & Wood, 2004). Social learning systems could be the potential bridge between teachers professional learning and student learning (measured achievements in an educational system), where “teachers learn how to be members of a community that values their thoughts and ideas, their knowledge and growth as a professional” (Lieberman & Wood, 2004 p.72). Within our Catholic Community of Practice, we have the ability to develop social learning through our shared Catholic foundations, based on engagement, imagination and alignment. Our engagement is focused on, “activities, talking and creating shared artifacts” (Wenger, 2010, p.184), for schools to participate in and we can harness our professional identity as Catholic educators to frame our position within the community. By engaging in new learning opportunities, we can solidify our identification and how we act (Wenger, 2010). An important shift will be the movement away from learning in their school and towards learning as Catholic educators across schools towards achieveing goals for the benefit of all students. Trust in the learning capability of the community will be fundamental for contributions that are relevant to the communities practice. This is achieved through, “having clear disciplines of meaning” (Wenger, 2010, p.194), and is present in the achievement goals within Community of Learning policy, ensuring the purpose and focus for improved student outcomes is always at the forefront of their learning. Each mode of belonging discussed helps the formation of a social learning system and the different forms of work required within them. The manner of accountability shifts from vertical accountability, common in our current hierarchical model in education, to horizontal accountability across a community through, “activities, standards of practice and commitment to collective learning” (Wenger, 2010, p.195). A challenge for a Community of Learnings social learning system will be that they are not “cleanly encompassed in organisations” (Wenger, 2000, p, 243), challenging the traditional process of management as they cannot explicitly control them (Wenger, 2000). This is the important work of leadership, to come up with new ideas and find a way of implementing to shift teaching practices for increased student achievement and outcomes. In the Community of Learning policy, leadership is conceptualized through distributed leadership. This is evident in policy where, schools and staff members commit to a new manners of collaboration (Hatcher, 2005, Storey 2004 as cited in Lumby, 2013), carefully balanced with increasing the workload of teachers (Lumby, 2013, Greany, 2017, Hill, Hawk & Taylor, 2001). Within the policy, high performing teachers and leaders are mobilised horizontally throughout the organization to build capacity for improved learning outcomes, which in the United Kingdom has shown positive impacts on student achievement and organisational capacity (Leithwood & Mascall, 2008, as cited in O’ Reilly & Reed). The positions of Lead Principal, Cross-and In school teachers and how they will operate are not defined explicitly, due to the innovative nature of the policy, which has never been applied to the New Zealand context. As such, the early implementation phase will require significant work and a balancing of tensions around trust and the professional boundaries of influence with and across schools (O’Reilly & Reid, 2011, Ball, 2003 and Lumby, 2013). An interesting challenge is the delivery of effective practice from one school environment to another whilst still respecting the professional autonomy of teachers and issues of sustainability over and above current teaching workloads. This model of lateral networks in the Community of Learning led by system leaders can offer “more sustainable and effective ways of addressing underperformance and developing and distributing innovation between schools” (Greany, 2017 ,p.58), with support from serving leaders for credibility (Matthews & Hill, 2010 in Greany, 2017, p.60). It places value on teachers, schools and the best school leaders sharing their practice for greater effect (Greany 2017, Vangen, 2017). This creates a shift to empower consumers of education in more active ways than under previous policy (O’Reilly & Reid, 2011), where Stewardship as a model leadership could become an emerging phenomenon. Stewardship leadership is a shift away from the focus on an institution and towards serving the community and empowering teaching staff to enhance student achievement outcomes (Masewickz & Vogel, 2014). The stewardship model can be used to “guide who leads and how they lead” (Masewickz &Vogel, 2014, p. 1095), so that all young people reach their potential. However, research over the last thirty years concludes, “collaboration is complex and prone to failure” (Vangen, 2017, p.263). To overcome this partners need to have “clear organizational goals that they agree on if collaboration is to be successful” (Vangen, 2017, p.265); these are provided for in the creation of a Community of Learning achievement targets. Leaders in the Community of Learning need to be aware of sustaining the meaningful work of teaching, while focusing on measuring performance based on achievement goals (Ball, 2003), otherwise the pressures on teachers becomes untenable. Partnership members must bring together their different “resources, expertise, culture and identity” (Vangen, 2017, p.266), focused around achievement goals and the benefit of the learners in their community. Through balancing tensions in distributed leadership, setting and managing explicit goals and the focus on students through a stewardship leadership lens achievement goals can be achieved. In this blog, I have completed a critical analysis of Community of Learning policy through the four lenses of policy, social capital, learning and leadership and how they operate within a collaborative agenda. On the basis of this, community of learning policy develops and enhances social capital by increasing collaboration between schools and the resources they have available. Social learning systems have the opportunity to develop through innovation funds and inquiry time on achievement challenges and the sharing of good practice across schools. However, the policy does remain silent that for social capital and learning to occur this requires shared trust, norms, values and time in a climate of competition that exists in our education system. Measures to record and report on achievement are provided although there is no explicit method of how schools will do this across a primary or secondary sector or the reasons why they should collaborate and share practice is not explicit. Part of this is due to the innovative nature of the policy, which has never been applied to the New Zealand context. What the policy does do is create the conditions for this to occur. Community of Learning policy cannot know in advance if this will increase student achievement, although case studies from the United States and the United Kingdom demonstrate improvements in learning through partnership. The policy is also silent on what form of leadership will successfully operate in a collaborative learning system. It does focus on new roles and pathways but does not identify measures to determine who or what makes a good leader in a community of learning and how to appropriately identify them. I have thought about this and it is because each community with different cultures, ethnicities and socio economic backgrounds may require different forms of leadership. It is a process that will become understood through the balance of tensions and complexities across communities of learning. I have learnt that collaboration as a policy agenda has potential in the New Zealand education system. Through creating shared norms, trust, values and explicit achievement goals we have the collective wisdom, skills and knowledge across our sector to address equity issues and achievement challenges. I am encouraged by this shift from competition and the movement away from in ward looking institutions. As educators we joined the vocation of teaching to help all students to reach their dreams and aspirations. The community of learning policy allows us to do this not on our own, but as a collective. Ball, S. (2003). The teacher’s soul and the terrors of performativity. Journal of Educational Policy, 18:2, 215- 228. Bourdieu, P. (1986). The Forms of Capital. In Richardson, J. (Eds), Handbook of theory and research for the sociology of education (pp. 241- 258). New York, USA: Greenwood Press. Dhillon, J. K. (2009). The Role of Social Capital in Sustaining Partnership. British Educational Research Journal, 35(5), 687-704. Field, J. (2009). A social capital toolkit for schools. In Allan, J., Ozga, J., Smith, G. (Eds), Social capital, professionalism and diversity (pp. 21- 33). Rotterdam, The Netherlands: Sense Publishers. Fullan, M. (1993). Change forces: probing the depth of educational reform. London, England: Falmer Press. Glatter, R. (2003). Collaboration, collaboration, collaboration. Management In Education (Education Publishing Worldwide Ltd), 17(5), 16-20. Granovetter, M. (1983). The strength of weak ties: A network theory revisited. Sociological Theory, 201. Greany, T. (2017). Collaboration, partnerships and system leadership across schools. In P. Earley, & T. Greany (Eds), School leadership and education system reform (pp. 56- 65). London, United Kingdom: Bloomsbury Academic. Hargreaves, A. (2003). Teaching in the knowledge society: Education in the Age of Insecurity. Maidenhead, England: Open University Press. Hargreaves, D. (2004). Networks, knowledge and innovation. Untangling the threads. In McCarthy, H., Miller, P., & Skidmore, P. (Eds). Network Logic: Who Governs in an Interconnected World (pp. 79- 88). London, United Kingdom: Desmos. Hayes, D. (2011) Reconnecting marginalised youth to learning. In D. Bottrell & S. Goodwin (Eds), Schools, Communities and Social Inclusion (pp.242 252). South Yarra, Australia: Palgrave Macmillan. Hill, J., Hawk, K. & Taylor, K. (2001). Professional Development: What makes it work? Paper presented at the annual conference of the New Zealand Association for Research in Education, Christchurch, New Zealand (6-9 December). Im, H., & Rosenberg, R. (2016). Building Social Capital Through a Peer-Led Community Health Workshop: A Pilot with the Bhutanese Refugee Community. Journal Of Community Health, 41(3), 509-517. Jansen, C., Cammock, P., & Conner, L. (2011). Leadership for Emergence: Exploring organisations through a living system lens. Leading & Managing, 17(1), 59-74. Lawrence, P. (2007) The strength of weak school ties, Research Associate Report, Nottingham:, National College of School Leadership. Liberman, A., & Wood, D. (2004). Untangling the threads. In McCarthy, H., Miller, P., & Skidmore, P. (Eds). Network Logic: Who Governs in an Interconnected World (pp.65- 74). London, United Kingdom: Desmos. Lumby, J. (2013). Distributed Leadership: The uses and abuses of power. Educational Management Administration & Leadership, 41:5, 581- 597. Masewicz, S.M., & Vogel, L. I. (2014). Stewardship as a Sense-Making Model of Leadership: Illuminating the Behaviors and Practices of Effective School Principals in Challenging Public School Contexts. Journal Of School Leadership, 24(6), 1073-1098. McCarthy, H., Miller, P., & Skidmore, P. (2004). Introduction in Network Logic: Who Governs in an Interconnected World. London, United Kingdom: Desmos. McCormick, Robert, et al. Researching and Understanding Educational Networks, Taylor and Francis, 2010. ProQuest Ebook Central, http://ebookcentral.proquest.com.ezproxy.canterbury.ac.nz/lib/canterbury/detail.action?docID=547323. Ministry of Education. (2014). Investing in Educational Success: working group report. Wellington, New Zealand: Ministry of Education. O’Reilly, D., & Reed, M. (2011). The grit in the oyster: Professionalism, managerialism and leaderism as discourses of UK public services modernization. Organisation Studies 32:8, 1079- 1101. Parata, H. (2014). Investing in Educational Success: design and implementation. Wellington, New Zealand: Ministry of Education. Wenger, E. (2010). Communities of practice and social learning systems: the career of a concept. In Blackmore, C. (Eds), Social learning systems and communities of practice (pp. 179- 197). London, United Kingdom: Springer – Verlag. Posted in Uncategorized on September 26, 2017 by jeremyreteacher. I have spent the last two days at Catholic Cathedral College enjoying some “Google Goodness” with the EdTeach Team. A special thanks to Tony Shaw for providing this opportunity and his willingness to sign me up to this event. The two days were jammed pack full of learning and I will focus on two presentations that really stood out to me. Simon was a fantastic teacher and descried his passion for Genius Hour and how to complete this in your class. I found this presentation interesting as it is somewhat similar to Project Based Learning and many of the resources that you will see in the presentation align with this form of teaching. For those of you who are wondering what Genius Hour is….it is essentially 20% of your class time for students to follow a passion and answer a question. This idea comes from an initiative within Google. If you are thinking that this sounds messy…it is but from the resources you will see there is a very strong structure when you start to scratch the surface. It begins with a driving question that the students want to answer usually completed on a Google Drawing and placed up in the classroom for the teacher and others to see. There is a strong focus on WHY the student is completing this project on a local, national and international level. The projects last ten weeks and require around 3 – 4 hours per week, which is time well spent once we get into the requirements students must complete! Students usually spend 90 minutes working on their projects and are provided with another 30 minutes to reflect on their work for the week on either a Google Slide Show or Google Site by completing a photo diary. I thought this was a great idea for those students who wonder whether they are progressing and provides time for the student to reflect on how far they have come. Students are limited to a pairs and there is an option to work by yourself. Simon noted that groups bigger than two generally lead to loafing whereby students are able to ride on the work of others. The main takeaway from this form of learning that it allows for students to have creative freedom and there is a real purpose behind their learning. This has always been present in education however it is often limited to subjects that allow it. Why not create a coding game on gradients or a social action in Social Studies? Students are in control of their learning and instead of being passive receptors of information they have to make judgement and decisions based on data. This is a skill that is often left to adulthood as we (teachers/parents) are always making decisions for them! I thoroughly enjoyed this presentation and look forward to integrating this along with my PBL initiatives. Kern started his presentation by discussing how he came to New Zealand seventeen years ago and was surprised by how self motivated and operating students were in a New Zealand Primary setting. He took this experience and applied it to his teaching practice in Maine on his return. An important question we were asked is what do students take for granted today? Our responsibility as educators is to prepare our students for how they use technology now and in the future. An example of this are: Pacific North Western Tree Octopus – an obviously fake group. However, to someone coming across this page it seems legitimate. Our work here is to guide students through reliable information and knowledge. It is not information overload. It’s filter failure. Our work is to help students navigate the pitfalls of technology so they gain what it has to offer. An important message for all in education today! Thank you to the EdTeach Team and the wonderful presenters who shared their passion for education. 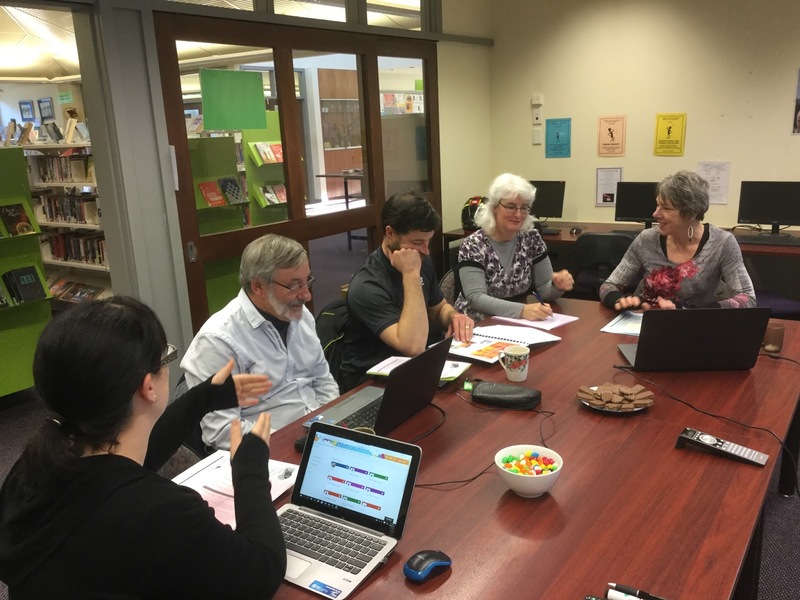 In April 2016, the Christchurch Diocese embarked on a research journey to create a supplementary resource to the Mandated Religious Education Curriculum. The research hypothesis was that through engaging materials and developing skills that highlight the relevance of faith in their lives, students will enjoy and actively participate in their faith journey. Flipped Learning is a pedagogy that promotes adaptive skills and knowledge for future success. This is through a student centered focus where they work through theological material at their current faith stage and are able to collaborate with others to ensure lifelong learning and faith development. It was envisioned that a learning environment where students are in control and can share their knowledge in inventive ways (Dumont, Benavides Bolstad & Gilbert, 2010). A range of Flipped Learning trials have been completed within primary, secondary and tertiary settings with the majority presenting positive impacts on student engagement and achievement. This report will scope how Flipped Learning improves personalised learning opportunities and increases students’ engagement. The Mandated Religious Education Programme is a fantastic programme packed full of rich meaning and faith experiences. Finding the balance between touching the head and heart was an important consideration for the development team. The work of Professor Groome from Boston College focused on providing students with knowledge and opportunities to express their faith. This is a simple focus whereby you cannot encounter Christ spirituality unless you have an understanding of who he is, where he came from and what his message is. Our programme focuses on providing a rich understanding of faith while at the same time providing more time in class for teachers to develop the spiritual lives of their students due to the re imagination of class time through Flipped Learning. An important feature of this programme was working with teachers in Year 7 & 8. It was important that we worked alongside teachers in the classroom who have an understanding of what students require. It would be easy to create a programme and push it down without understanding what the students or teachers need in order for this initiative to be successful. This was not the view of the development team and see this programme as a grassroots movements where teachers will provide feedback, resources and ideas for continued development. Two teachers were seconded for a total of five weeks and developed a programme based on educational feedback and two trials involving five schools and over 200 students. Students are provided with a Pre- Test which covers the learning aims and objectives within the unit. This data is automatically generated for the teacher and broken down into key ideas within the unit. Early in the learning teachers are able to clearly identify the strengths and misconceptions of their students The data from this assessment will be compared to the Post Test data to see how far they have moved the needle in terms of their students learning. Within the Church Strand Unit is rich religious literacy, many of which is relevant if students are to understand and apply this in their faith journey. These terms and concepts come up regularly during the Church Strand and provide a foundation for student understanding and the application of ideas. To provide students with a strong understanding of this was important and was provided to them in a ‘maintenance format’ where they could complete vocabulary quizzes to refresh and develop their understanding of religious literacy used throughout the Unit. We were also committed to honouring the founding document of Aotearoa New Zealand The Treaty and Waitangi and provided an opportunity for students to develop their pronunciation and application of Te Reo. A concern for many educators with the Flipped Learning model is that it requires a large amount of Homework time. The research on this is varied and we took the view of content being asynchronous for students. If students would like to complete work outside of class they are able to and encourage teachers to use the In – Flip model whereby they watch learning content in class time. This decision will be made by individual teachers and will be determined by the students they have in front of them. Again this programme is to develop teacher capacity, not to tell them how to do it. A second concern is the use of video content. Within Flipped Learning their is a misconception that all Flipped content has to be video. This is incorrect and their are great examples of ‘unplugged content’. For the purpose of this research project we used video content due to the schools that we were catering for. Being able to watch the videos as many times as I want instead of asking the teacher all the time is helpful. To support this we also had Watch – Summarise – Question Sheets for each Key Idea (Video Content). This provides questions for students to answer during and after watching video content. Research on the use of video content suggests providing questions at the conclusion of the video if they shorter than eight minutes. Providing no questions for students to answer has shown to have low knowledge retention rates. Following direct questions are opportunities for students to ask questions they have based on the content. This could be wondering questions, confusion questions or clarification questions. These are answered in a class discussion and enable all students to have a voice as they can contribute their thoughts and ideas to each other’s questions. By doing this the teacher is able to address student misconceptions as soon as possible before they move onto learning tasks. The application of knowledge based on video content follows Bloom’s Taxonomy. Included within each key idea are creative learning tasks which require students to apply their knowledge and faith to a real world scenario. We focused on students being the creators of content from their faith and knowledge rather than mere consumers. As part of the learning tasks students are required to complete at least two learning activities before they can sit a Mastery Quiz of the Key Idea. Teachers analyse the Pre – Test data and the Watch – Summarise – Question Sheets to guide students to particular learning tasks via a Must Do/ Can Do list. By completing a minimum of two learning tasks it will provide students with enough knowledge application to complete a Mastery Quiz. An important feature of the learning tasks is the formative feedback that teachers are providing to students throughout their learning. Due to the teaching being able to focus on answering questions and providing feedback they are able to deepen their students understanding with direct instruction being recorded and accessible at any time. If students do require help with content they can be redirected to the video content, their Watch Summarise Question Sheets and the teacher in the classroom. Mastery Quizzes are important and the final steps for students to complete for each key idea. Once a student has received feedback on their learning tasks and the teacher is comfortable with their understanding they will complete a Mastery Quiz. This Quiz covers ten multiple choice questions which relate to the learning objectives of the Key Idea. The data is sent directly to the teacher and the student receives immediate feedback via a self marking Quiz. To move onto the next key idea students must pass by 80% or more. If they do not reach this milestone they will be redirected back to a learning task and receive feedback from the teacher around their misconceptions. Another Quiz will be sent to the student with a different set of questions where they can again attempt to gain 80% or more. Once students have completed all key ideas within the unit they complete a Post Test. This test focuses on learning objectives throughout the unit and operates via a multiple choice Quiz. Teachers are able to view the data and compare this to the Pre – Test taken at the beginning of the unit. Developments and lingering misconceptions can be viewed and shared with students for further development and discussion. Due to the re imagination of class time we know that students and teachers will be able to see the development of knowledge and their faith with increased class time given to prayer and spiritual development as the teacher is not spending this time lecturing or providing direction instruction which has already been recorded. The resource team will gather together in Term 4 (2017) to review and reflect upon the feedback we receive. If there is evidence that this structure and this process and these types of online resources provide an option that assists Religious Education teaching and enriches student learning in Religious Education, and we are at least heading in the right direction, albeit that we need to continually learn from the classroom feedback and refine and add to the bank of digital resources and online approaches, we would continue with our research project. If we do continue into a fourth phase of this project, we would look to crowd source other voices and faces from teachers and students (and priests/bishop) throughout the Diocese to be the voices and faces of our knowledge/content input videos. If we do continue we would definitely be sharing our learning and this structure and this collaborative process with the National Centre for Religious Studies (NCRS), and The Catholic Institute (TCI), and the NZCBC. In this way, if our structure and process proves to have validity and “legs” we (i.e. RE teachers and administrators throughout the various Dioceses of New Zealand) could collaboratively crowd source and take responsibility for particular strands and thus relatively “quickly” provide such online resources to augment the teaching of our NZCBC-mandated primary (and Years 9 & 10?) RE curriculum. Professional competence is the necessary condition for openness to unleash its educational potential. A lot is being required of teachers and managers: they should have the ability to create, invent and manage learning environments that provide plentiful opportunities; they should be able to respect students’ different intelligence’s and guide them towards significant and profound learning; they should be able to accompany their students towards lofty and challenging goals, cherish high expectations for them, involve and connect students to each other and the world. Teachers must be able to pursue different goals simultaneously and face problem situations that require a high level of professionalism and preparation. How can we enhance the Directors of Religious Studies role in our Catholic Schools? This post will ask important questions of our Catholic Schools in New Zealand. I write these in order to open up robust discussion and the sharing of ideas for those operating, leading and interested in Catholic education. The reason why I will be asking questions rather than providing answers is summed up by E.E.Cummings – Always the beautiful answer I who asks a more beautiful question. We sometimes have cultures that tend to discourage questioning and inquiry in the form of ‘Why are we doing this?’ To highlight my point a recent study found that the average four year old child in the United Kingdom asks on average 390 questions per day! Questioning in this sense is an essential part of being human, like breathing, an acceptable part of life. Questions challenge established authority and disrupt traditional hierarchy. It encourages people to think about doing something differently. Rather than seeing questioning as a challenge, what if we looked at questioning of our current Catholic education system as an opportunity for our Catholic Schools to grow and develop? What if all Directors of Religious Studies were required to be a member of the Senior Management team? Would this see an increased number of well trained and energetic teachers applying for Directors of Religious Studies positions? How would this attract greater numbers of talented Catholic teachers? Would Directors of Religious Studies be seen as an elite professional standing on par with the Principal within Catholic Schools? What if New Zealand had a Directors of Religious Studies Graduate Programme? What if we operated this Graduate Programme in a similar way to the Alliance for Catholic Education? Would this provide a new leadership pathway for teachers, current pupils within our Catholic Schools and attract other professionals from sectors outside of Education who are passionate about their faith? How would this increase the quality and range of individuals applying for DRS positions? Does it increase the standing of the Director’s of Religious Studies position within a Catholic School? What if Directors of Religious Studies were offered scholarships to study Educational Leadership and Theology overseas? How would this increase authentic Catholic leadership within our Catholic Schools? What if teachers were offered opportunities to study Theology or Catholic Leadership? Would this increase the number of encounters our students have with the person of Jesus Christ? In New Zealand we will have some readers who think that we are too small in order to achieve some of these aspirational goals. They might say “we don’t have the population size, we don’t have the financial resources, we don’t have the participants, we don’t have the resources”. But there isn’t anyone else. We have the ability to answer these questions. The question is: Are we bold enough to do something about it? Please share your thoughts and ideas around the questions presented. I look forward to your insights. Four benefits and an opportunity in the Flipped Classroom approach! It has been over eighteen months since I attended a workshop and introduced to the Flipped Classroom. The presenter discussed the ability of her Mathematics students to stop, pause and rewind her teaching around a particular concept. We watched a short video of her class in action – the students were engaged, active and mentoring one another by practicing the content the teacher had presented in class time. The concept of watching video content to learn or understand something was not foreign to me. Just a week earlier I had taught myself how to reconnect the tie cord on my lawn mower after it had fallen off! I left the presentation reflecting on the benefits of this shift in teaching time and space and how I could get it underway with two classes as a trial. I was also aware that this would not be a miracle panacea for my teaching and also decided to delve deeper into this pedagogy by completing research into Flipped Learning through the University of Canterbury. A question that often comes up when discussing Flipped Learning is that there is no definitive research or data that demonstrates its effectiveness. I would begin by stating that the body of peer reviewed literature into Flipped Learning, Flipped Classroom and Inverted Classroom is small however, it is growing at an exponential rate. In an analysis completed by Robert Tolbert, 38 articles were written in the first half of 2016 for Flipped Learning, Flipped Classroom or the Inverted Classroom. In the image below you may notice a sharp spike in 2012. It coincides with the year Jon Bergmann and Aaron Sams released their book ‘Flipping your classroom’. If you continue to hear there is no research basis for Flipped Learning – this is simply not true. There is a rapid shift in the amount of research and scholarship being produced on this pedagogy. Take a look at this bibliography I have compiled for you to have a look at the range of studies that have been completed. In this post I will outline four benefits and an opportunity to develop in the Flipped Classroom approach. It is important that we encourage awareness of cases where the Flipped Classroom approach did not work. Doing so allows us to continue to develop and refine the Flipped Classroom approach rather than declaring victory too early. At the center of Flipped Learning is its focus on individualizing learning. Class Time is spent focusing on problems, questions, inquiry and project based learning (Roach, 2014, Halili & Zainuddin, 2016, Lage, Platt & Treglia, 2000). This enables time for teachers to help students stuck on a difficult concept or a problem that traditionally is completed during homework time (Bergmann & Sams, 2014, Hung, 2015, Straw, Quinlan, Harland & Walker, 2015). In a traditional classroom, this interaction would not occur as often because teachers spend the bulk of their time lecturing content. In this model the teacher becomes a, “facilitator and students become the focus of the class.” (Talley & Scherer, 2013, p. 340) Flipped learning has been identified as one of the most promising approaches to transforming learning for our students (Hung, 2015). It encourages students to take responsibility for their learning and to, “learn at their own pace and to make faster progress than would otherwise have been the case.” (Straw, Quinlan, Harland & Walker, 2015, p. 4). Little research has been completed on the impact of Flipped Learning however, the sheer number of teachers that have reported successful implementation of the strategy provides evidence of its powerful use as an instructional method (Enfield, 2013). Students across studies have shown the ability to interact with content that suits their learning style, allowing the teacher to have a greater insight into student understanding, resulting in increased interaction with students (Peters, 2015, Enfield, 2013, Roach, 2014). Recent case studies of Flipped Learning discuss the benefits of increased learner agency and their ability to manage their learning. Due to the range of technology available to students it has increased their ability to have greater autonomy of their learning and when they complete this learning. A recent study completed by Waikato University, into a first year Engineering class, found that, “90% of students appreciated learning in their own time and 84% at their own pace.” (Peters, 2015, p. 6). This skill of autonomy and independent learning is significant to Flipped Learning and could be, “appropriate for preparing students for a 21st century career that will require continued on job learning.” (Enfield, 2013, p. 25). Within a trial of nine schools in England and Scotland, teachers noted that students were more willing to learn for themselves and this helped them developed a positive work ethic (Straw, Quinlan, Harland, Walker, 2015). Flipped Learning enables more time for learning where students can apply their knowledge in labs, problems and tasks, requiring students to use the higher order skills of Bloom’s Taxonomy (Bergmann & Sams, 2014, Talley & Scherer, 2013, Hung, 2015, Love, Hodge, Grandgenett & Swift, 2014). Students’ curiosity is triggered, developing their, “tactile memory of speaking, discussing and solving problems with their classmates instead of the basic learn and recall that traditionally happens.” (Roach, 2014, p. 78). As noted by students across many studies; the more interactive the class environment meant the more likely they were to be focused and engaged with their learning. The notion of Flipped Learning is a grassroots teaching movement where initial concepts are covered outside of class, allowing class time for students to participate in a more comprehensive and thorough understanding of content. (Bergmann & Sams, 2014, Hung, 2015, Straw, Quinlan, Harland and Walker, 2015). This teaching pedagogy shifts, “learning into any time and place, not only being limited to class time.” (Roehl, Shweta & Gayla, 2015, p.45). Where, “today’s students can access online video resources, anywhere at their convenience.” (Halili & Zainuddin, 2016, p. 2). A technique that is created through this pedagogy is Just in Time Teaching (JiTT). In this strategy, the teacher reviews students’ understanding before class through formative assessments and, “adjusts the in class activities to address the deficiencies reflected in the assessments (Love, Hodge, Grandgenett & Swift, 2014, p. 320). Other formats ask students the question before class, ‘What did you find difficult or hard about the content in this video?’ The teacher is then able to begin class with these questions and work through any misconceptions that the students have. The JiTT approach adapts the content to where students’ understanding is at the moment of confusion. This strategy is, “a natural application of one to one teaching that is possible when students are working in class time.” (Roach, 2014, Kim, Kim, Khera & Getman, 2014). The student is able to clear up any confusion immediately and the, “instructor is able to monitor performance and comprehension,” (Lage, Platt, Treglia, 2000, p.37) which would be otherwise difficult in a traditional classroom. Teachers and students, within the Flipped Learning model, have indicated issues with the model around student completion of work, incorrect video content, poor quality video instruction and lack of preparation for this pedagogical shift. In order for this learning programme to operate, students need to have high levels of self management. It places, “more dependence on the student and their own learning,” for which some students are not yet ready (Peters, 2015, p. 6). A number of studies found that students in Flipped Learning environments expressed concern that the, “teacher was not teaching and they were just being told to Google it.” (Enfield, p. 22). Flipped Learning requires students to develop analytical skills where the teacher acts as a guide to direct them to potential solutions (Enfield, 2013, Kim, Kim, Khera & Getman, 2014), while working on collaborative tasks in class. The main challenge in beginning this programme is the amount of time to create videos/content that relate to their teaching topic (Tucker, 2012). When searching for video content already available, many teachers found that, “content was technically erroneous and did not relate to course learning outcomes to make them relevant to the programme,” (Peters, 2015, p. 8) requiring large amounts of time investment if completed by untrained teachers. As a result, many times teachers produce poor quality video content where students do not want to watch video content. Finally, access to technology can be another barrier particularly around access to resources which are predominantly in a digital format (Roach, 2014, Enfield, 2013, Bergmann & Sams, 2014). Many students can become frustrated if there are technical issues with out of class content, although teachers must provide an alternative if this is an issue. Although a range of studies have been completed, there is no specific evidence that, “Flipped Learning had improved student grades,” (Kim, Kim, Khera & Getman, 2014, p. 46) which needs to be taken into account if shifting to this teaching method. Flipped Learning is an approach to teaching that is growing in popularity throughout primary, secondary and tertiary education sectors by providing active learning experiences for students. In this reflection I have outlined five benefits to this approach and one area for continued development. In the past people may have scoffed at this approach due to the lack of data and research on its effectiveness on learning. However, the amount of research and peer reviewed literature being produced is continuing to grow. Flipped Learning, Flipped Classroom, the Inverted Classroom, will continue to re imagine the use of time, space and expertise in learning. If you are interested in this approach please review the bibliography for a fantastic range of research and feel free to comment below. Bergman, J. & Sams, A., (2014). Flipped Learning: Gateway to Student Engagement. New York: International Society for Technology in Education. Peters, M. (2015). Flipped Learning in an Undergraduate Engineering Class. Austrlasian Association for Engineering Education, 15 (6). 10-18. Roehl, A., Shweta, L., & Gayla, S. (2013). The Flipped Classroom: An Opportunity to Engage Millennial Students Through Active Learning Strategies. Journal of Family and Consumer Sciences, 105 (2), 44-49. Straw, S., Quinlan, C., Harland, J. and Walker, M. (2015). Flipped Learning: Research Report. London: Nesta. Zainuddin, Z., & Halili, S., (2016). Flipped Classroom Research and Trends from Different Fields of Study. International Review of Research in Open and Distance Learning, 17(3), 36-53. In recent weeks, I have increased my research of Project Based Learning (PBL) and how this can be integrated into our Flipped Learning Programme. PBL was introduced to me as a student in 2004, by my History and Economics teacher David Ivory. The skills and benefits this pedagogy developed in me still remain today. I will present two articles based on Project Based Learning (PBL) and invite you to share your story in the comments section at the end of this blog. Brigid J. S. Barron, Daniel L. Schwartz, Nancy J. Vye, Allison Moore, Anthony Petrosino, Linda Zech, John D. Bransford and The Cognition and Technology Group at Vanderbilt, The Journal of the Learning Sciences Vol. 7, No. 3/4, Learning through Problem Solving (1998), pp. 271-311. In this article the authors explore the implementation of Project Based Learning (PBL) based on literature and their work with Year 6 classes in Nashville, Tennessee. Social organizations that promote participation and result in a sense of agency. We are specifically interested in three questions. First will our rockets go higher if we sand and paint them or leave them unfinished? Second, will the number of fins have any effect on the height of the rockets. Primarily 3 fins vs 4 fins? Third, does the type of nose cone have an effect on the height of the model rocket? This learning provides a bigger picture without entailing the ill- defined complexity of open ended projects. Each of the problems consisted of video based stories. The stories follow a narrative structure with one exception: they do not end with a conclusion but rather with a challenge for students who are watching. This scaffold asks people to analyse the difference between two or more examples. This helps them notice dimensions of information that they may otherwise miss if only considering a single example. For example: comparing two wines side by side can help one notice a distinctive flavour in one of the wines. An emphasis on self assessment helps students develop the ability to monitor their own understanding and to find resources and deepen it when necessary. Content specific resources – These resources allow students to compare their solutions with solutions and explanations generated by others around the country who are working on a similar problem and project based curricular. In these cases the assessment is generated by both teacher and student and it is followed by opportunities to revise the product that has been assessed. This involves careful consideration and attention to the social organisation of the classroom. There are many ways to support active, reflective learning. Small group interactions, opportunities to contribute, peer review, and having access to data about how others have thought about the same problem. Establishing norms of individual accountability – set up a requirement that each person in the group has to reach a threshold of achievement before the group can move on and collaborate on a more challenging project. For example each individual must explain how pollution affects dissolved oxygen before the group can monitor the river. Provide outside audiences for student presentations to be videotaped and evaluated by adult members of the learning community. These presentations, coupled with authentic outcomes and fairly explicit criteria for what counts as a good plan, can provide a strong incentive to revise. Dimitra Kokotsaki, Victoria Menzies & Andy Wiggins, Improving Schools, Vol. 19 (3), Project – based learning: A review of the literature, (2016), p 267 – 277. Students through PBL learn to be self reliant through goal setting, planning and organisation; they develop collaboration skills through social learning and become motivated by being encouraged to exercise an element of choice, while learning at their own level (Bell, 2010). Implementation of a project based concept mapping developmental programme to facilitate children’s experiential reasoning (Habok, 2015) reported positive results for the experiential group in two kindergartens in Hungary. On the effectiveness of PBL in Primary School in Greece, Kaldi, Filippatou, and Govaris (2011) argued that primary age students can develop content knowledge and group work skills in addition to motivation and positive attitude towards peers from a different ethnic background through PBL instruction. In a US study, Geier (2008) reported that seventh and eighth grade students who participated in project based inquiry Science units showed increased science content understanding, better process skills and significantly higher pass rates on the statewide test over the remainder of the district population. In Australia, Stewart (2007) investigated the link between self directed learning readiness, such as having high self management skills, was a key enabler for achievement learning outcomes from PBL. Student Support – Students need to effectively guided and supported with an emphasis given to effective time management and student self management, including making safe and productive use of technological resources. Teacher Support – Regular support needs to be offered to teachers through regular networking and professional development opportunities. The support from school senior management is crucial. Effective Group Work – High quality group work will help ensure that students share equal levels of agency and participation. Balancing didactic instruction with independent inquiry method – work will ensure that student develop a certain level of knowledge and skills before being comfortably engaged in independent work. Assessment emphasis on reflection, self and peer evaluation – Evidence of progress needs to be regularly monitored and recorded. An element of student choice and autonomy – throughout the PBL process will help students develop as sense of ownership and control over their learning. In 2015 a group of schools came together to analyse how they were teaching Religious Education. Data from student surveys revealed some students were disengaged in Religious Education and students noted they had little opportunity to apply their faith and understanding of the Church across different curriculum areas. The group had a vision that students within our Catholic Schools need to be, “lifelong learners and have adaptive skills which are critical in a world” (Dumont, Istance & Benavides, 2010, p.8) that is rapidly changing. The pedagogy of Flipped Learning was identified as addressing some of the challenges around engagement and faith experiences. Flipped Learning places direct instruction outside or inside the classroom so that students are able to receive accurate information and spend more time in class developing their knowledge and faith experiences. This ensures the tailoring of learning to meet the needs of all children (Ministry of Education, 2015, p.16). We believe Flipped Learning meets the New Zealand Curriculum’s aim of individualised learning where students have ownership of their learning. The delivery of the Religious Education programme allows for this pedagogy to operate whereby students at different faith stages work through content at their own pace, reviewing content with teacher direction. Teachers are able to “focus on developing soft skills, student potential, develop a notion of continued learning and allow for student voice” (Miles, 2016, p.4). The drum that beats that education is requiring a paradigm shift is becoming louder as the education system we have today is changing from that which it was founded in the 19th century. Today our students expect greater choice and control over their learning which they experience in their day to day lives through food, sport and product selection. An important question educators need to ask is if there is a need for “schools to change, why then have there been so few successful efforts?” (Degenhardt & Duignan, 2010, p.16). To tackle this question we must look to a process that views this as an adaptive challenge, a challenge that has no set process in order for it to be overcome. Is merely outlining the benefits of Flipped Learning to teachers, and how this pedagogy will benefit their students, enough? This question from a fellow teacher encouraged me to rethink our implementation of Flipped Learning in Religious Education. 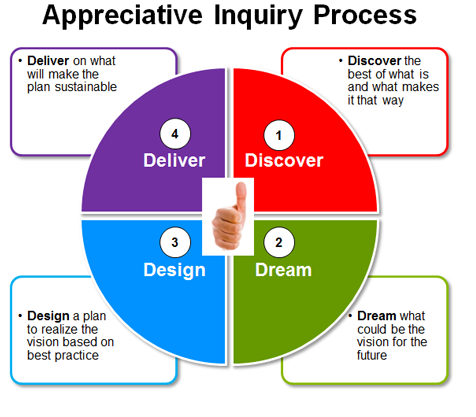 The Appreciative Inquiry is an organisational development tool. Appreciative Inquiry focuses on supporting people getting together to “tell stories of positive development in their work that they can build on” (Reed, 2004, p.42). Information collected in this sharing is utilised in the learning space continuing the developing knowledge of the participants and the growth of the group as a whole. Appreciative Inquiry can also include interviews, reflection on relevant literature, leadership consultants analysis of emerging themes. To begin the development of the Flipped Learning Programme, we began with teachers sharing what is already going well within their classes; where engagement and personalisation is being addressed well. By doing this teachers share, “stories of positive development in their work that they can build on” (Reed, 2004, p.42). Information that is shared in this process will help to develop the, “knowledge of the participants and the group as a whole” (Jansen, Cammock, Conner, 2011, p.62) and allow them to discuss their natural strengths. Creating shared values and purpose for the Flipped Learning initiative was important for teachers to understand why they should be involved in this process. This began with interactions around the question: ‘Why are we all here and what is important to us as teachers?’ The reasons created were shared amongst the participants so they see what they have in common and what is driving them. This will created a, “community based on trust and respect” (Hill, Brandeau, Truelove & LIneback, 2014, p. 96) with clear indications of what they are working towards on an emotional level. Educational leadership consultant Michael Fullan states that for, “complex change you need people to work together and commit themselves to the action” (Fullan, 1993, p.35). By providing opportunities to explore what motivates them as educators and how Flipped Learning can be applied to their values and beliefs, all teachers who are participated contributed their ideas and skills to the initiative. Further, participants needed to have a shared understanding of the rules of engagement whereby, “conflict must be focused on ideas rather than individuals” (Hill, Brandeau, Truelove & LIneback, 2014, p. 99). A focus must be given to generate new ideas through debate allowing intellectual conflict. Participants focused on, testing and experimenting whereby the group learns from their experiences and adjust plans based on the results. Peck (1991) suggests that a “healthy organisation is one in which all participants have a voice” (p.62). Once the purpose and environment of the Flipped Learning programme was created we looked at harnessing the skills and strengths of each contributing teacher. In order for the programme to be innovative Hill, Brandeau, Truelove and Lineback (2014), in their article ‘Collective Genius’ note that leaders must draw out the, “slices of genius in each individual” (p.62). This was achieved by providing the group with a place for innovation to occur whereby the, “community are able and willing to create new ideas” (Hill, Brandeau, Truelove & LIneback, 2014, p.96). Teachers had autonomy over the Flipped Learning process through the purpose and values system where they operated according to their strengths. This was created by teachers trialling and sharing ideas through the ‘Sandpit Area’ on our Moodle site. Create Content – Learning is doing. A final success factor in the Religious Education Flipped Learning programme was setting up a community focused on, “searching, doing, learning and modifying” (Kotter, 2014, p. 47). It is important for every member is to be seen as an equal in the creation of content and work environments by allowing teachers to use their strengths in a positive environment. Teachers must be confident to test and experiment their integration of Flipped Learning and learn from feedback/ peer data, “adjust plans on the results” (Hill, Brandeau, Truelove & LIneback, 2014, p.99). This led to continued innovation of the programme where teachers used their skills and experiences to create engaging and personalised learning opportunities through Flipped Learning video content, quiz creation or learning activity creation. Flipped Learning is a pedagogy that can increase engagement and personalised learning opportunities. It begins with asynchronous video content, students can move through the curriculum at their own pace. The teacher then guides students through active learning tasks where they apply their knowledge through debates, discussions, case studies and application. Often times when beginning a shift in pedagogy it is hard for this to gain traction and momentum. Through using the Appreciative Inquiry process and demonstrating the benefits of Flipped Learning to teachers, we are starting to see our movement grow. Degenhardt, L. & Duignan, P. (2010) Dancing on shifting carpet: reinventing traditional schooling for the 21st century. ACER Press: Victoria. Heifetz, A.R. & Laurie, L.D. (1997). The work of leadership. Harvard Business Review, January, 124- 134. Hill, L., Brandeau, G., Truelove, E. & LIneback, K. (2014) Collective Genius. Harvard Business Review, June, 94-102. Katzenbach, J., Steffen, I. & Kronley, C. (2012). Culture change that sticks: Start with what’s already working. Harvard Business Review, July, 110-117. Kotter, P.J. (2012). Accelerate! Harvard Business Review, November, 45-58. Miles, A., (2016). Investigation into Future Focused 21st Century Classrooms that provide teaching and learning that enables us to meet the key competencies of the New Zealand Curriculum. Ministry of Education Sabbatical Report, July- August, 1-8. Ministry of Education. (2009). Ka Hikitia – Managing for Success 2008-2012. Updated 2009. Wellington, New Zealand: Author. Ministry of Education. (2015). The Ministry of Education – Four Year Plan 2015- 2019. Wellington, New Zealand: Author. Peck, M. (1991). A Different Drum: Community – making and peace. (New York: Simon & Schuster). Reed, J. (2004) Appreciative Inquiry: Research for change. (Thousand Oaks, CA: Sage). Top Five Tools for Religious Education! Today I will introduce five new tools to use within your Religious Education class. They range from digital newspapers through to gamification. Badgelist is a free app that allows teachers to create digital badges for student achievement and evidence of learning. You can upload a range of different badges for areas students have mastered within a topic. To get started here is a great badge template and a badge requirement template. Turning a Google Form into a quiz got much easier with the addition of quiz options! Now, with a few clicks of a button, your Google Form can be transformed into a self-grading assessment you can share with students as a formative assessment. After completing your Google Form, click on the settings button. You will then notice you have a few different options now, one of those being the Quizzes tab! Click on this tab and slide the “Make this a quiz” button and your Google Form is now set up to be a self-grading assessment. HSTRY allows users to create interactive, digital time-lines that can be easily shared online. Teachers can create timelines using pictures, videos, text, and gifs, and upload those timelines to their HSTRY class page. Students in your course can create their own timelines or collaboratively work on content shared by the teacher. Yesterday Andrea Craig (Villa Maria), Daryl Shute (Villa Maria), Thomas Newton (St Thomas of Canterbury College), Anita Neilson (Middleton Grange School) and Ruth Velluppillai (Middleton Grange School) met to discuss teaching scripture in Religious Studies. The purpose of the meeting was to analyse AS 90816 – “Describe the purpose of a sacred text within a religious tradition”. The meeting operated on the “Norms of Collaboration Model” whereby every individual has an equal voice. There is a focus on questioning and challenging each-other in a respectful manner. We expect that through questioning, our own understanding is challenged which will help us grow in our teaching practice. – The best of what is taking place within our schools and what enables this to occur. * What aspect of this topic do you and your students enjoy? * What do you do to make this topic more engaging for your students? * What questions would you like to ask the other teachers gathered here around their practice? * What is your “piece of gold” you would like to share and present to us? To continue this “Discover” step we have created a shared management system where each school will contribute one lesson and one resource that they think increases learning outcomes for their students. A network system has been created where teachers are able to freely interact and share their learning with each other. We have created this by placing the teachers name on the resource so they can explain the purpose and benefits of using this within your class. How often do we receive a resource that is not explained and then find it difficult to use? Ruth presented her best practice around assessment and how to instill reverence when teaching scripture. It provides us with some probing questions that we should reflect on. During Term Four, after senior exams we will meet again to look at what the future for AS 90816 is especially around student engagement and understanding. The ‘design’ process will involve the creation of a shared plan involving ideas, resources, tools and assessment features. From here the group can look at the implementation of this plan and sythesise some of these ideas down further to ensure successful implementation in 2017. Thank you to Andrea, Daryl, Thomas, Anita and Ruth for being committed to the development of Religious Education within their school. With the end of another busy term it is important to reflect on the well-being of our colleagues and ourselves. Many of your may have heard Ian Vickers (Deputy Principal, Sancta Maria Catholic College) speak on this subject. “The art of looking after one’s self, or caring about your own well being is a jigsaw of learnt habits. Teaching is an extremely demanding profession and it is vital that you make sometime for ‘you’ during each working day”. To learn a new positive habit you need to remember to adopt this new activity on a regular basis. We all need reminders, so seeing an aircraft in the sky may be the trigger to remind you to re-hydrate and have a drink of water. You need to think about a few triggers that will remind you to regularly practice a new approach! Examples of triggers: Our College is on the Airport flight path so seeing or hearing an aircraft could work for you. Having a special screensaver on your computer could be a trigger. A poem, a photograph on your desk, a treasured item that you frequently see or even the school bell, could be a trigger. It could be the smell from a fragrance from your tissues or a room air freshener. If could be another external noise such as a distant motorbike or police siren. In essence pick a few things that will constantly remind you to remember to follow a new activity. Here is the teacher wellbeing page for New Zealand teachers and a teacher well being resource Ian had created for schools to adopt. Ian also participated in a podcast with international leadership consultant Justin Baeder. Have a fantastic and relaxing Term Three holiday break!